“The Church of Yeezianity” by Matt Wilstein: This new religion reveres Kanye West as Yeezus, “a divine being who has been sent by God to usher in a New Age of humanity,” according to the religion’s official website. In an interview with Noisey, the anonymous founder of Yeezianity—who insists that no, this is not a joke—said, “Jesus has all this baggage and all these connotations, and Yeezus is this new thing. . . . Yeezus is when Kanye elevates to that God-level, which I feel like we all have the potential to do.” He also says that Kanye has the highest moral standards of anyone today. Oy vey. Kanye West made Rolling Stone‘s February 9, 2006, cover story. His song “Jesus Walks” has been hailed as one of the greatest hip-hop songs of all time. The Young Messiah: This new movie set to release next March follows Jesus at age seven as he returns home to Galilee and starts growing into his religious identity. Based on the Anne Rice novel Christ the Lord: Out of Egypt. “Refuting 5 False Theories about Jesus” by Kyle Dillon: Jesus the Pagan Myth. Jesus the Failed Prophet. Jesus the Moral Philosopher. Jesus the Violent Revolutionary. Jesus the Ahistorical Existentialist. “Photos of European Churches Left in Holy Ruin” by Anika Burgess: Photographer Hans van Vrouwerf has a fascination with lost faith and forgotten places of worship and has visually documented about twenty abandoned churches around Europe. “15 Religion Treasures at Yale” by Tom Krattenmaker: Yale University houses artistic and literary treasures relating to various religious faiths, and the fifteen that Krattenmaker highlights are all available for public viewing. Those from the Christian tradition include a Gutenberg Bible, a wall painting extracted from a third-century house church in present-day Syria (which features one of the earliest depictions of Jesus! see image below), and the original handwritten text of the sermon “Sinners in the Hands of an Angry God” by Yale alum Jonathan Edwards. Christ Healing the Paralytic, third century. 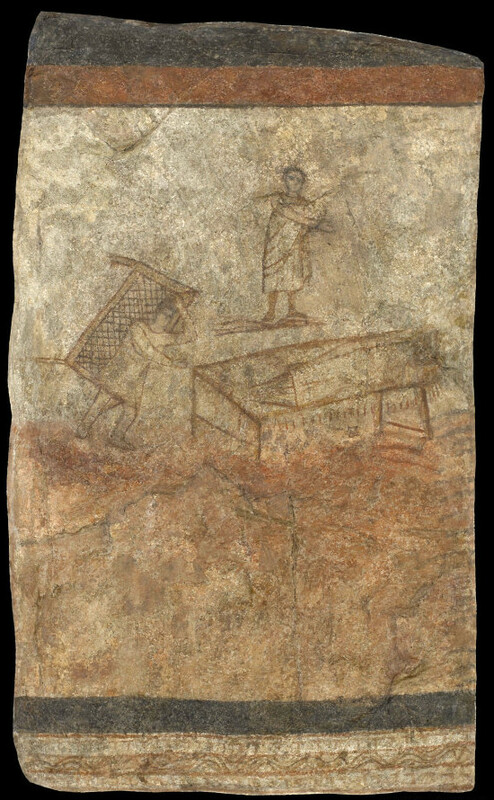 Wall painting extracted from the baptistery at Dura-Europos, now housed at Yale University Art Gallery, New Haven, Connecticut. This entry was posted in Film, Pop Culture, Roundup. Bookmark the permalink.